The stars have arrived for the London premiere of “Into the Woods”. The first pictures have been added to the image library. Both the premiere and photocall albums will be further updated with additions over the evening, so make sure to refresh those gallery pages. Edit: Lots of additional pictures have been added. 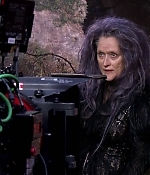 With so many promotional featurettes for “Into the Woods” being published lately, I’ve capped Meryl’s interviews, on-set and film moments from all and combined them in the image library. 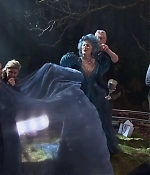 All featurettes can be found in the video archive, with two new – Costumes of the Woods and Designing the Woods – being added as well. 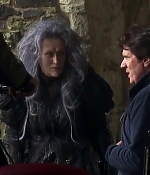 The video archive has been updated as well, with a bunch of new featurettes on “Into the Woods”, including a new scene and additional television spots. 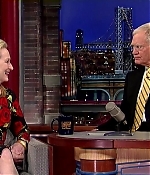 There’s also a video from the Academy of Motion Picture Arts and Sciences in which Meryl reveals her favorite movie as well as her speech at the Kennedy Center Honors. Screencaptures from the Kennedy Center Honors have been added as well, alongside a couple of “Into the Woods” additions. 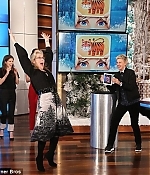 As earlier reported, Meryl Streep, Emily Blunt and Anna Kendrick have joined Ellen DeGeneres on her show to promote the theatrical release of “Into the Woods”. 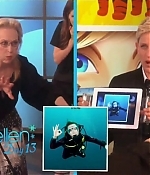 As always on Ellen, this has been a funny interview with anecdotes from the film and a round of “Heads-up”. Edit: A great quality video has been added to the video archive with screencaptures being added to the image library. Lots of new video clips have been added. 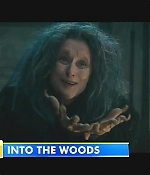 The television spots for “Into the Woods” have been updated with three more spots, showing quite some new scenes. Then, a video compilation with reports from the New York premiere of the film, an excerpt from the Academy Conversations that featured Meryl Streep, Anna Kendrick and Rob Marshall. There’s a third official clip featuring the Witch, the Baker and his Wife. Further, Nightline’s cast interview (which is just warmed up from last week’s ABC World News Tonight) and Britain’s BBC Talking Movies, which reported on the film and premiere as well. Scroll down for a complete list of the latest additions. 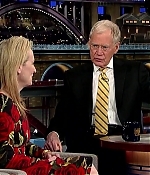 Yesterday, Meryl Streep was a guest on the Late Show with David Letterman to promote the theatrical release of “Into the Woods”. While I’m waiting for the full appearance to surface, an excerpt from the interview has been added to the video archive. Screencaptures have been added to the image library. Edit: More clips, including a lenghty press junket interview and a segment with E! Entertainment, have been added to the video archive as well. 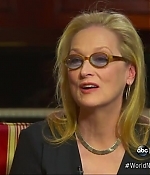 Yesterday, ABC aired their World News Tonight segment on “Into the Woods”, featuring an interview with Meryl on the streets of New York, and joined by her co-stars for a conversation about the film. It looks like this is only an apetizer since the cast will be featured on Nightline next week. The full video as well as screencaptures can be found in the archives. Many thanks to Glenn for the heads-up. This morning, Meryl has been a guest on Live with Kelly and Michael to talk about “Into the Woods” (and her disastrous Thanksgiving). The full interview and screencaptures can be found in the image and video archives. 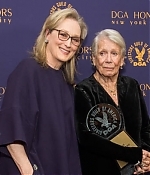 Also, Meryl’s speech at the Gotham Independent Film Awards have been added alongside screencaptures, a new segment from Entertainment Tonight, featuring interviews with Meryl, Emily Blunt and Chris Pine, and press images from the taping of “Good Morning America” with many thanks to Claudia for sending them in. Enjoy the new additions. 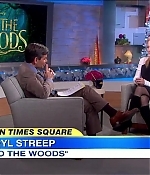 This morning, Meryl has visited Good Morning America to promote Into the Woods. She talked about finally playing a witch after refusing it so often in her past, the recent internet story of Emily Blunt saving her life, and what role she would like to play that she hasn’t played. The full interview can be watched in the video archive with HD screencaptures being added to the image library. 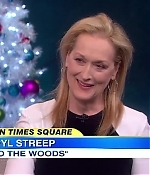 As promised, new video clips from the “Into the Woods” promotion has been added. There’s a new tv spot with quite a few new scenes, excerpts from the Yahoo Movies Q&A and the press conference in New York, a segment of Meryl receiving the Presidential Medal of Freedom in the White House as well as two television interviews with Access Hollywood and Extra. Enjoy the new clips.